I’ve been watching the live feed of the House of Commons for the past hour, waiting for the report stage of the “transparency” bill to start. 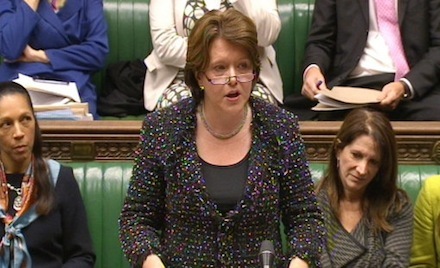 As such, I’ve watched Maria Miller’s statement on the regulation of the press and her time and again defend the long drawn out Leveson process on the basis that it leads to stronger regulation. Is holding these two debates consecutively the government’s idea of a joke? Let’s look at the two processes: the Leveson process kicked off in May 2011 following a massive public outcry. Leveson himself reported just under 12 months ago. The plans to overhaul the system for non-party campaigning at elections were announced the day before the summer recess this year, following no outcry whatsoever, either from the public or anyone else. The government has bent over backwards to attempt to establish cross-party and stakeholder agreement on how best to implement the Leveson proposals. When it comes to the gagging law, there has been no pre-legislative scrutiny, no white paper and the old statutory requirement of a 12 week consultation period has already been relegated to the dustbin. Both processes have profound implications for our civic society and the public’s ability to hold their government’s to account. The only difference appears to be (in stark contrast to the ludicrous claims of the gagging law’s advocates) that newspapers are owned by millionaire businessmen. Voluntary organisations are not. If Rupert Murdoch ran 38 Degrees, you can bet this law would be getting more scrutiny than it is now. To hear Maria Miller discuss the evils of rushing through legislation really is difficult. I hope the irony will not escape MPs when debating the bill this evening and tomorrow. One of many reasons for not subsidising national parties is that it will further encourage them to ignore the public and live in the lap of the national press. I note that he says ‘national parties’ specifically and not ‘political parties’ more generally (i.e. he seems to accept a different case can be made for local politics). But leaving that aside for one minute, and the ongoing argument that it depends on what kind of ‘subsidy’ you’re talking about (giving political parties money every time it engages with a member of the public would surely encourage it to engage with as many people as possible), this is illogical in the extreme. The tabloid press exists because it flatters the prejudices of the general public. It is very much ‘in tune’ with the public. Therefore, if political parties were thrown into their arms, far from ignoring the electorate, they would be indulging it. It’s a common fallacy to assume that something that you think is common sense is a view shared by the majority, and that the only reason it isn’t public policy is because politicians are wicked or ‘out of touch’. You here it all the time from environmentalists, constitutional reformers and teenagers (all three of whom I’ve spent most of my political career hanging out with). The problem with our political system is not that the majority of the public don’t get the majority of what they want most of the time – they do. The real problem is that the system doesn’t allow for minority or dissenting views to be heard with any real force. A society which lacks meaningful self-criticism finds the process of change extremely difficult, even when it is neccessary. As such, we are beginning to resemble more of a closed society than an open one. Democracy, for me, is about more than the majority getting its own way: that’s mob rule. Democracy has to be about deliberation and hearing all sides of the argument before rushing to conclusions. Our great challenge is introducing systems – and a civic culture – that enable that to happen.